Healthy grilling doesn’t have to be an oxymoron. You can enjoy tasty, delicious grilled food without compromising your healthy diet or your commitment to an active lifestyle. Some of our favorite foods happen to be grilled, from cheeseburgers and roasted corn, to s’mores and grilled sandwiches. These foods became iconic of summer, emblems of get-togethers and summer good times. Use these tips to find healthful alternatives to the usual grilled fare, from growing your own vegetables to grill to Asian-inspired grilled stir-fries. Cooking fruit brings out the natural sweetness found in many summer fruits. In some cases, the warm, slightly caramelized texture changes the flavor of the fruit…for the better. Grilled pineapple and watermelon are delicious, but so are bananas, peaches, and plums. 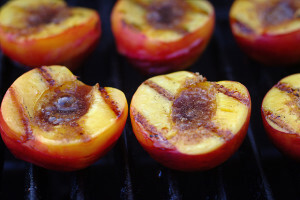 These tasty fruits double as decadent desserts once you grill them. If you’re really hankering for that burger, go ahead and have it. Just make it a veggie burger. You can make your own burger from chickpeas and grated veggies. To lower the carbohydrates, you may want to serve the burger on a bed of lettuce. For last minute BBQ, there are some good brands of vegetarian burgers on the market. Look for vegetable-based burgers with limited ingredients. If you can’t pronounce or recognize the ingredients, opt for a brand made from ingredients you know. Get a stir-fry basket for your grill to make delicious vegetables your family will love. Snow peas and carrots are particularly suited for this method. Mix in soy sauce or a homemade teriyaki glaze for an Asian flair. Many Asian cuisines utilize grilling techniques. By cooking at home, you reduce unnecessary MSG, salt, and fat. Grilled vegetables are delicious. Corn is the well-known example of grilled vegetables, but you can grill root vegetables like potatoes, too. Some people even like to grill the vegetables they grow in the garden. We recommend it as a fun activity families enjoy together. If you’re looking to revamp your health and nutrition, contact us today for a consultation.